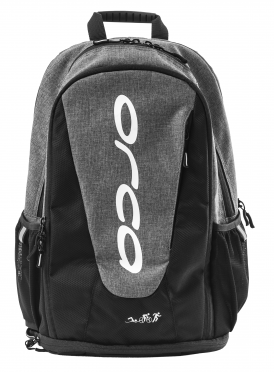 The new Orca Daily backpack combines a casual design with the compartments that every triathlete needs in their day to day. It has five spaces: one with padding designed for a computer, another for storing wet clothes and three more compartments for storing everything you need. The backpack that is adapted to your daily life. The Funkita Elite squad backpack Ocean delight is the ultimate backpack for training and competition. 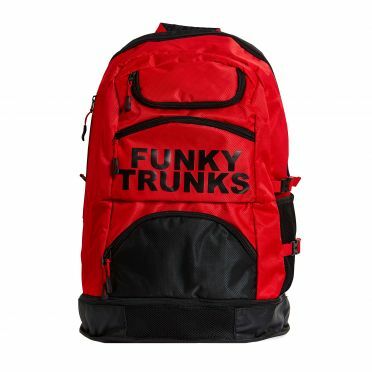 This backpack has up to 36L capacity with multiple segments including fabric-lined goggles compartment, waterproof base compartment for shoes and wet towels. With a mesh compartment, a cooler bag zip pocket to keep drinks and food cool and Large main section with laptop pocket you've got plenty of space to take everything you need. The back panel is comfortable padded and the shoulder straps come with a chest strap for postural support. 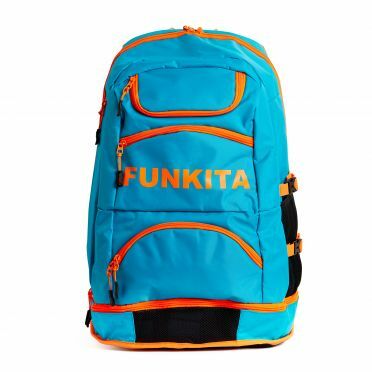 The Funkita Elite squad backpack Blue lagoon is the ultimate backpack for training and competition. This backpack has up to 36L capacity with multiple segments including fabric-lined goggles compartment, waterproof base compartment for shoes and wet towels. With a mesh compartment, a cooler bag zip pocket to keep drinks and food cool and Large main section with laptop pocket you've got plenty of space to take everything you need. The back panel is comfortable padded and the shoulder straps come with a chest strap for postural support. 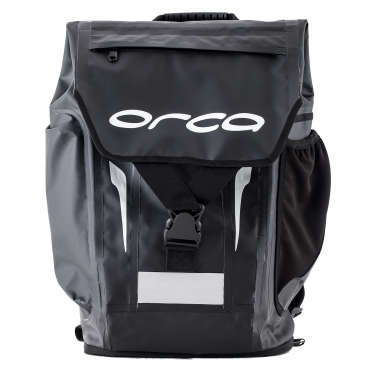 The Orca Urban waterproof backpack can carry everything you need while on your bike ride, or enroute to the start line on race day secure in the knowledge that what’s inside will be kept 100% dry. This 22L PVC backpack’s seams are completely heatsealed with roll top construction to make this bag waterproof. The addition of a mesh side pocket and waterproof side pocket helps you store smaller items securely for easy access. A padded back panel with curved shoulder straps and adjustable sternum strap keeps this bag comfortably in place while a handy helmet compatible shock cord system on the front of the backpack keeps your helmet securely stowed. 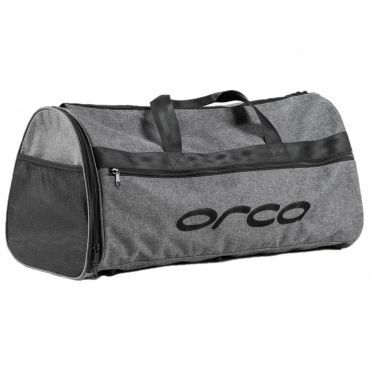 The Orca Training bag is the sports bag you have been waiting for. 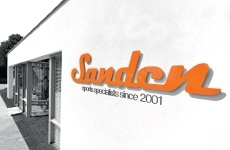 Perfect for your daily training sessions at the track, gym or pool, it’s also an ideal accessory for your everyday activities. 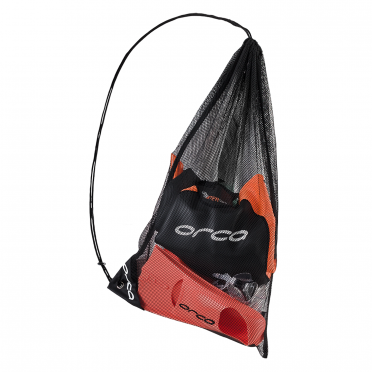 With the Orca quality seal, it has everything you need: several storage areas and a separate water-tight compartment for your sports shoes or damp clothes. A practical and versatile rucksack to move around on the road. The Blueseventy Brick bag is our most versatile bag. Designed to fit only the essentials for a swim workout or a cycle and run commute it features a snug, tapered design that rides higher on your back to minimize bouncing while on the go. The main compartment includes a hydration pocket. A smaller front pocket will hold necessary items. A deployable mesh helmet holder doubles to keep wet clothes from gear inside. This bag is made for people on the go. 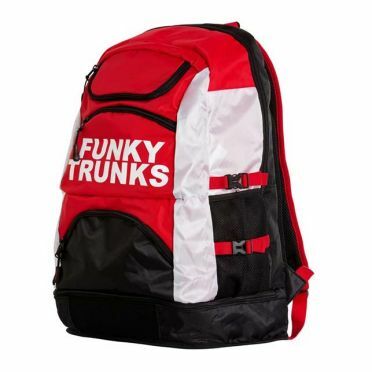 The Funky Trunks Elite squad backpack Race attack is the ultimate backpack for training and competition. This backpack has up to 36L capacity with multiple segments including fabric-lined goggles compartment, waterproof base compartment for shoes and wet towels. With a mesh compartment, a cooler bag zip pocket to keep drinks and food cool and Large main section with laptop pocket you've got plenty of space to take everything you need. The back panel is comfortable padded and the shoulder straps come with a chest strap for postural support. 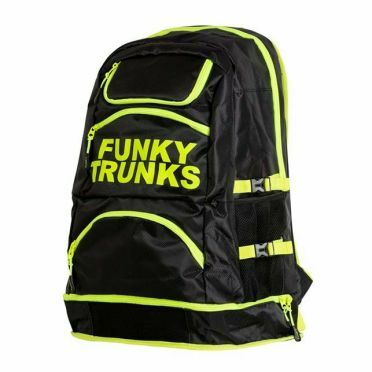 The Funky Trunks Elite squad backpack Night lights is the ultimate backpack for training and competition. 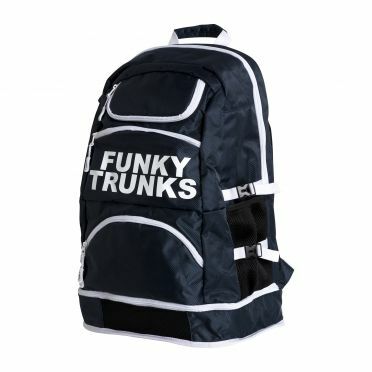 This backpack has up to 36L capacity with multiple segments including fabric-lined goggles compartment, waterproof base compartment for shoes and wet towels. With a mesh compartment, a cooler bag zip pocket to keep drinks and food cool and Large main section with laptop pocket you've got plenty of space to take everything you need. The back panel is comfortable padded and the shoulder straps come with a chest strap for postural support. 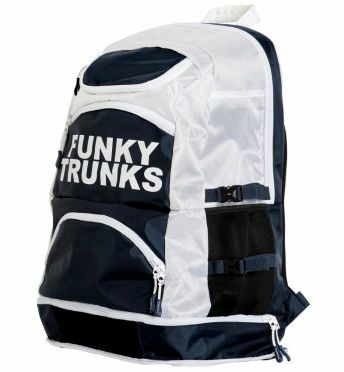 The Funky Trunks Elite squad backpack Navy blast is the ultimate backpack for training and competition. This backpack has up to 36L capacity with multiple segments including fabric-lined goggles compartment, waterproof base compartment for shoes and wet towels. With a mesh compartment, a cooler bag zip pocket to keep drinks and food cool and Large main section with laptop pocket you've got plenty of space to take everything you need. The back panel is comfortable padded and the shoulder straps come with a chest strap for postural support. 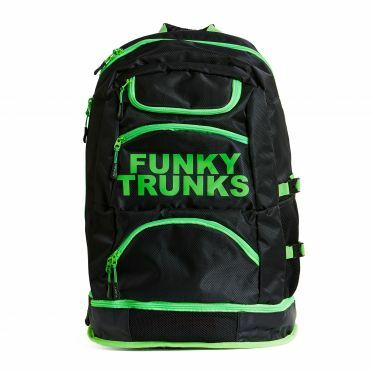 The Funky Trunks Elite squad backpack Deep ocean is the ultimate backpack for training and competition. 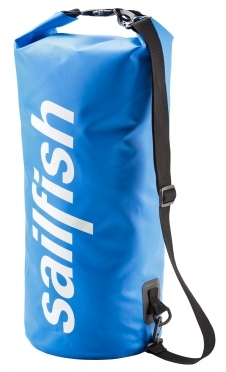 This backpack has up to 36L capacity with multiple segments including fabric-lined goggles compartment, waterproof base compartment for shoes and wet towels. With a mesh compartment, a cooler bag zip pocket to keep drinks and food cool and Large main section with laptop pocket you've got plenty of space to take everything you need. The back panel is comfortable padded and the shoulder straps come with a chest strap for postural support. 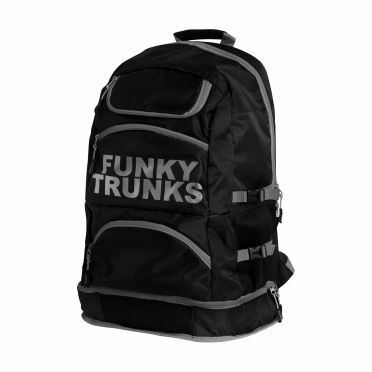 The Funky Trunks Elite squad backpack Night rider is the ultimate backpack for training and competition. This backpack has up to 36L capacity with multiple segments including fabric-lined goggles compartment, waterproof base compartment for shoes and wet towels. With a mesh compartment, a cooler bag zip pocket to keep drinks and food cool and Large main section with laptop pocket you've got plenty of space to take everything you need. The back panel is comfortable padded and the shoulder straps come with a chest strap for postural support. The Funkita Elite squad backpack Sun kissed is the ultimate backpack for training and competition. This backpack has up to 36L capacity with multiple segments including fabric-lined goggles compartment, waterproof base compartment for shoes and wet towels. With a mesh compartment, a cooler bag zip pocket to keep drinks and food cool and Large main section with laptop pocket you've got plenty of space to take everything you need. The back panel is comfortable padded and the shoulder straps come with a chest strap for postural support. 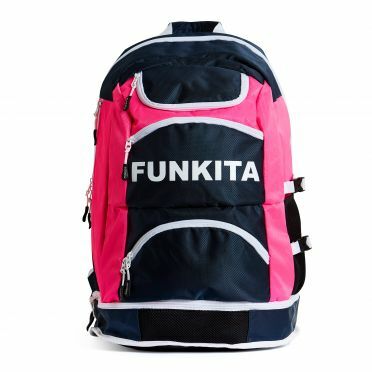 The Funkita Elite squad backpack Pink shadow is the ultimate backpack for training and competition. This backpack has up to 36L capacity with multiple segments including fabric-lined goggles compartment, waterproof base compartment for shoes and wet towels. With a mesh compartment, a cooler bag zip pocket to keep drinks and food cool and Large main section with laptop pocket you've got plenty of space to take everything you need. The back panel is comfortable padded and the shoulder straps come with a chest strap for postural support. 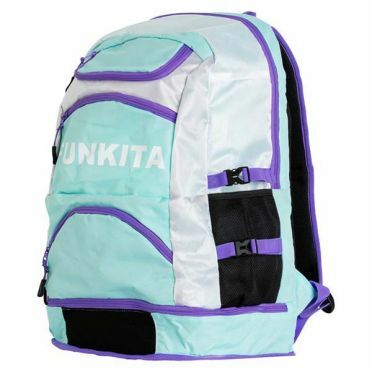 The Funkita Elite squad backpack Mint dreams is the ultimate backpack for training and competition. This backpack has up to 36L capacity with multiple segments including fabric-lined goggles compartment, waterproof base compartment for shoes and wet towels. With a mesh compartment, a cooler bag zip pocket to keep drinks and food cool and Large main section with laptop pocket you've got plenty of space to take everything you need. The back panel is comfortable padded and the shoulder straps come with a chest strap for postural support. 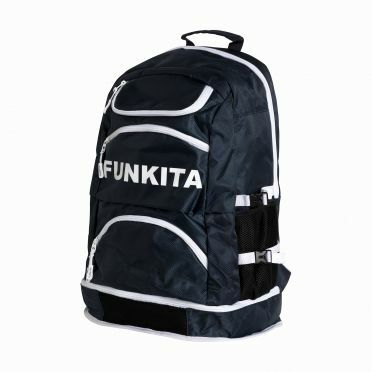 The Funkita Elite squad backpack Deep ocean is the ultimate backpack for training and competition. This backpack has up to 36L capacity with multiple segments including fabric-lined goggles compartment, waterproof base compartment for shoes and wet towels. With a mesh compartment, a cooler bag zip pocket to keep drinks and food cool and Large main section with laptop pocket you've got plenty of space to take everything you need. The back panel is comfortable padded and the shoulder straps come with a chest strap for postural support. The Funkita Elite squad backpack purple power is the ultimate backpack for training and competition. 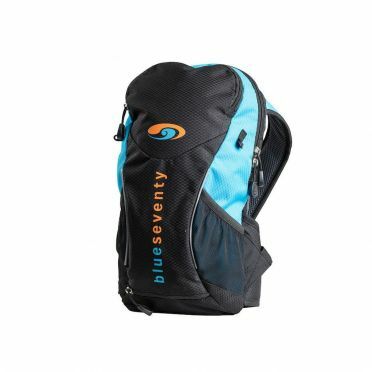 This backpack has up to 36L capacity with multiple segments including fabric-lined goggles compartment, waterproof base compartment for shoes and wet towels. With a mesh compartment, a cooler bag zip pocket to keep drinks and food cool and Large main section with laptop pocket you've got plenty of space to take everything you need. The back panel is comfortable padded and the shoulder straps come with a chest strap for postural support.